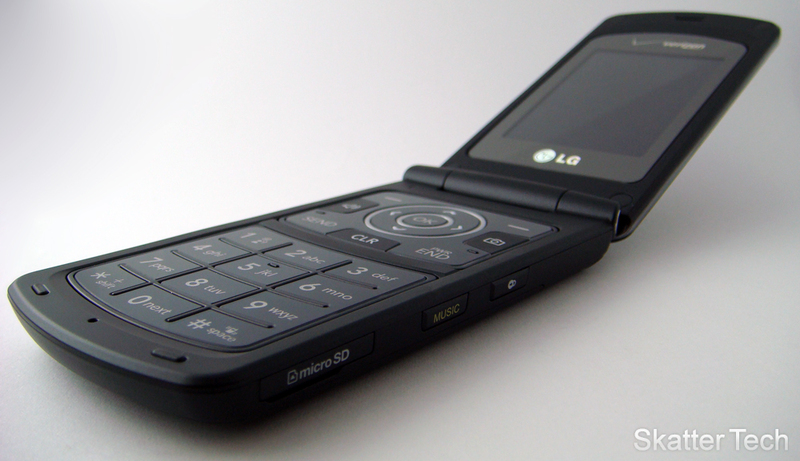 Last month Verizon Wireless rolled out LG’s third Chocolate phone, the Chocolate 3 (VX-8560). Just like its predecessors the Chocolate 3 is aimed towards music lovers and this version surely will not disappoint. While remaining simple and stylish, the phone has plenty of new features including a standard 3.5mm headphone jack and a built in FM Transmitter which owners will appreciate. The Chocolate 3 is fairly compact and can fit into most pockets. It is a bit too long when flipped open and will reach past most people’s ears and mouth in both directions. This is the first officially branded Chocolate phone which isn’t a slider, but rather a flip phone. It retains some elements from its ancestors such as the click wheel on the front, unfortunately it isn’t touch sensitive. The front side of the phone also features an unusually large 1.76 inch display which has a beautiful rotating interface. The camera is also on the front and allows taking self portraits using the external screen. 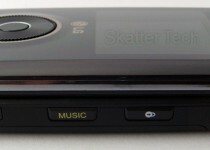 The microSD card reader, the Music key, and lock button can be found on the right side of the phone. The left side contains the 3.5mm headphone jack, the volume toggle, voice command key, and the microUSB port. The inside of the phone is quiet basic; it has a standard numeric keypad, four way navigation, two soft keys, and the Send/END buttons. The only real downside I encountered was finger print magnet nature of the shinny metallic finish on the front side. Other than that body of the phone is well built and should last. The 1.76 inch external display with a 176 x 220 pixel resolution looks excellent, but unfortunately only in doors. Due to the glossy finish, it is quite difficult to view outdoors or when covered with fingerprints. The 2.2 inch internal display is fortunately much better and looks quite sharp with its 320 x 240 pixel resolution. There’s nothing too impressive here, but is just fine for most simple tasks. Verizon once again has used their standard interface on this phone, but it’s got a couple of special themes as most phones do today. Browsing through the menu system was smooth and clean. Navigation was consistent and easy to follow. The external display has a couple of functions: music player, photo gallery, the camera, calendar, and messages. This secondary interface was actually quite polished for once. It easy to use and performed as expected. It was quite easy to take self portraits and listen to music. But regarding the internal interface, there’s not much that has changed in the past couple of years, so hopefully we’ll see something more revolutionary in the near future. All you get with this phone is the standard icon menu which opens up into the classic tabbed interface. The Chocolate 3 is a fairly decent phone for messaging. Although it has just a numeric keypad, the software allows text, picture, and video messaging. The standard Verizon Wireless Mobile IM client for AOL, MSN, and Yahoo is also available. Email can be accessed through either the WAP browser or the Mobile Email client. The phone supports 1000 contacts with plenty of extra fields for extra numbers. The Chocolate also has the standard call history views for displaying missed, incoming, and outgoing calls. 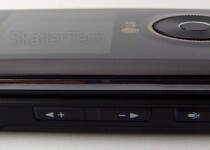 Since the VX-8560 is a music phone, you would expect it to do quite an excellent job at playing music. Although this might be the best Chocolate 3, there has not much improvement that has been made in this area over the past couple of years. To start listening to music, you can just hit the Music key on the side, which will quickly launch the player. As always you can browse your library in different by Albums, Artists, Genres, Songs, or Playlists. There were also some preset equalizers which may help some music sound better. The Chocolate 3 supports pushing the music app into the background allowing performing other tasks. The music is also automatically paused and resumed when a call is received. The player flows between the external and internal display smoothly. So if you start playing a song with the phone open, the interface will move over to the external display when closed. Overall it is a fairly decent player for a phone, but once again there was room for a lot of improvement. Lots of people still don’t have an auxiliary port or an iPod connectors built into their vehicles. Most of those people use a FM transmitters to listen to music from their portable device on their stereo. The Chocolate 3 doesn’t need any extra accessories to broadcast music on a station since it’s got that component built right in. All you’ll have to do is find an open frequency, set it on the phone, tune into that channel. The quality was pretty good during most test runs. It is obviously not comparable to Satellite Radio, CDs, or a wired media player; however this is probably the next best thing for many. The only downside might be that battery life takes a steep hit when using this feature. LG claims 24 hours of transmitting FM if the phone is placed into the “music only” mode. The LG Chocolate 3 supports up to 8GB microSD cards, which is great for those planning to use it as their music playback device. 8GB cards have also come down in price and can be purchased for as low as $30 through some major online retailers. When you connect your phone to your machine using the included microUSB to USB cable, you can enter the data or sync music mode. The data mode will turn the microSD card into a mass storage device so you can add or remove content directly onto it. The sync music mode will allow syncing media with Windows Media Player 11. Unfortunately Vista users will have no choice but to install the horrid V Cast Music Manager to get the phone working with WMP11. If files are placed directly into the music folder, the phone will manually re-index them the next time the music player is started. So to put all of that together, the phone can be synced as a media player device, a mass storage device, or by using a microSD card reader. The 3.5mm standard headphone jack is the main feature that gives the Chocolate 3 the ability to call itself a music phone. Users of this phone can now plug-in their own headphones without the need of any additional adapters or a special headset. The playback quality is decent. Audiophiles won’t even consider it; however the majority of people probably won’t be able to tell the difference between the Chocolate and an iPod for instance. The speaker is quite loud and is fairly clear; however I probably would never use them for listening to music. As for the speakerphone functionality, it works just great. This phone wasn’t really made for taking pictures, but nonetheless it has a simple camera for snapping photos occasionally. 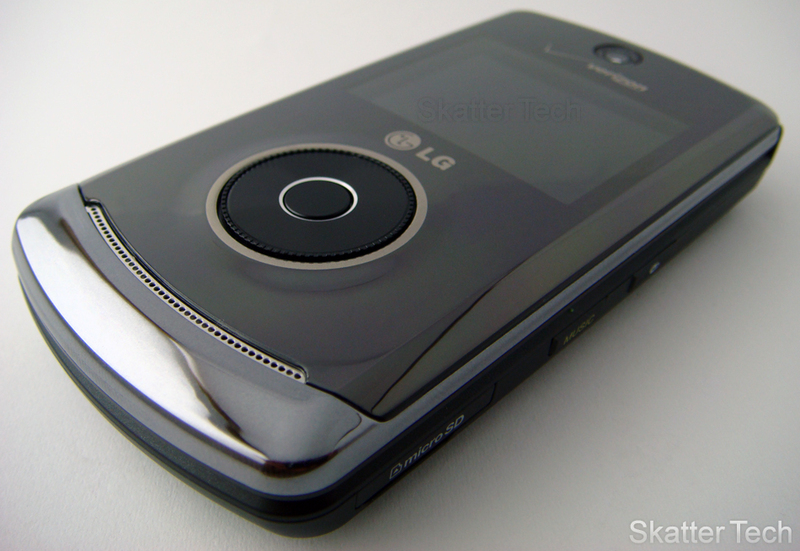 It’s got some basic features such as changing brightness, resolution, digital zoom, and some color effects. Nothing is too interesting. The LCD screen which is the view finder will only display a small portion of a picture that is being taken, which is often annoying. 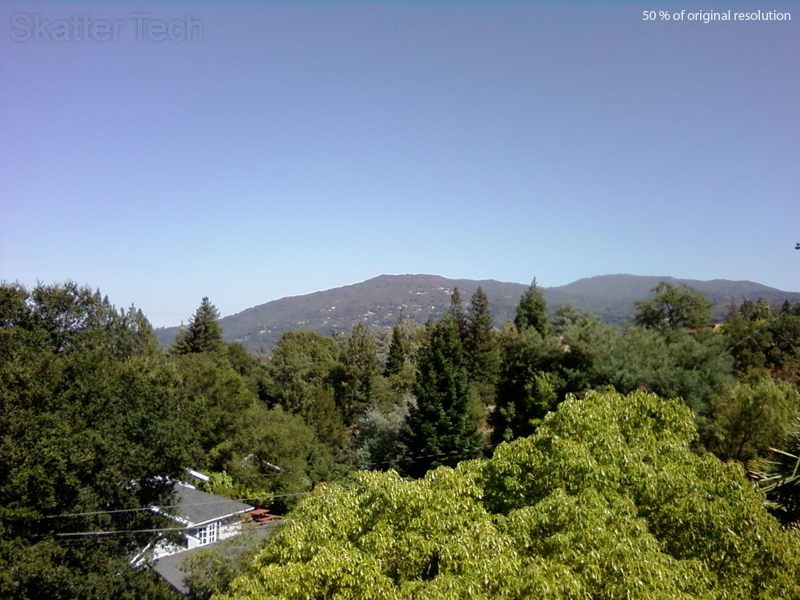 The image quality was mediocre; my two year old LG enV was on par if not better than this phone’s camera. The only neat feature might be the ability to take self portraits using the large external display since the camera is already facing you. The phone can also record videos, but those are also not too pretty. 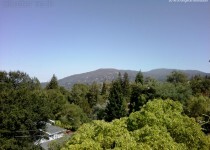 One improvement was the gallery which offers many more options on ways to handle the images you have taken. Overall imaging is an extra feature; the music playback is the main focus of this phone. A small feature which I loved was the power supply that was included with the phone. Instead of providing an addition data cable, the power supply is actually a USB cable in disguise. 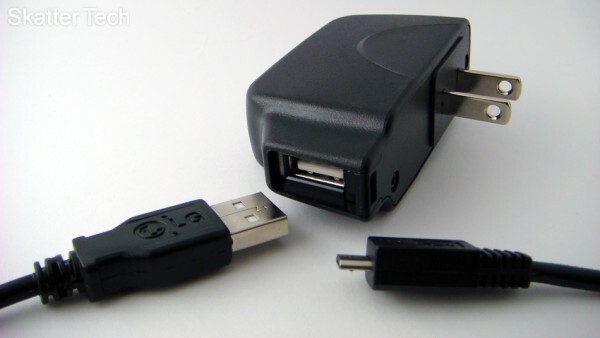 The cable can be unplugged from the head and can be plugged into a USB port to charge or sync data. As for software extras, the phone’s got the standard extra goodies such as Get It Now, WAP Browser, Bluetooth tools, Clocks, Calendar, Calculator, Tip Calculator, Alarm Clock, Notepad, Voice Commands and more. This phone is a major improvement over the previous two Chocolate phones; however it now has a new form factor which may not be appealing to the owners of the previous models. This is an excellent mid-range phone and will not disappoint. Those who are looking for a high tech phone probably won’t find this too satisfactory. As mentioned before this is a perfect fit for those who are also looking for a phone that can playback music while on the go. The phone is available in stores and online for around $100 with a new two year contract. If you are eligible for upgrade you should be able to knock off $50! After reading this review, i found interest and planning to switch from my Nokia N 72 to LG. The review is very informative about a lot of different features of the phone, but why didn’t you review the call quality? i meant slider phone on line two. sry for the mistake. but i still like the phone! i want the one in blue. I got this phone, but it’s in blue. I like it, except when you open it, it’s a really big phone! I prefer the smaller versions, not looking like I’m talking on a 80’s cell phone. Oh well. But, It takes good pictures, 2.0. And, the FM transmitter, it doesn’t work as well for me, I live in a bigger city with a lot of radio stations, so I don’t get that great of a reception. So, if you live in a big city, you might have problems with the FM transmitter as well, a lot of cutting in and out. I really like this phone. The 3.5mm jack is great–but only because the FM transmitter is crap. I called Verizon and they told me the FCC limits them to a 4 foot transmission power. I just use my old FM transmitter instead. My adapter was failing so I am really glad to see the 3.5mm. One of these days I might get an antenna splitter for my car and try to tape the phone cradle on it to see if the reception is better. I will say, however, that when I get out of town the FM transmitter is much better. That is a great feature and somebody REALLY needs to bribe the FCC to bump the power. I really like being able to listen to tunes and do other stuff at the same time but there are still some things I can’t do which bugs me. When I am sitting on the crapper or at the doc’s office or whatever I wish I could listen to tunes AND play games. Maybe on the Chocolate IV (LG/Verizon r u listening?). Also, my bitpim calendar synch with Google Cal fills up the memory and I don’t know why. This is bugging me but I’ll figure it out eventually. The screen has a higher resolution which is nice for pics but some games I need to wear my “cheaters” to see the fraggin thang (too bad for us visually challenged freaks I guess). Everything else is nice and there have been a bunch of software upgrades making things easier than my old 8600. This thing doesn’t hold a candle to the Motorola Krave. It’s got a full touch screen and a two megapixel camera (which are my favorite features). Check out the full feature list online at motorola.com/krave. I’ve been a fan of this thing ever since I started working with Motorola. I love it. I was looking for a good phone. I am a car tuner and enjoy being able to get into customer cars and go to my “station” on the radio while in the car and not worrying about leaving anything behind when I am done. Windows 7 automatically picked up the drivers for me. Yet, with the drivers, I am only able to sync music not data. Any help? I too have been either e-mailing Verizon or talking to the m on the phone for at least 6-8 hours over the past 2 weeks. I have had zero luck trying to get the computer to recognize the phone. At present the phone will not sync to the computer using Windows XP service Pack 2 and all the drivers have been downloaded from Verizon and are in place. I’m ready to give up on the Chocolate 3. This is ridiculous. And this whole “ringtone” thing is lame. If I can’t use my songs as ringtones or make my own, what’s the point of even using the phone. As a musician, I’m not about to become famous enough for Rhapsody to feature my music- so I can pay to download CERTAIN SONGS as ringtones, for $3 ea. All in all, I give this phone a 3/5. Because LG Messed this one up on purpose. Oh and even though I have to use WMP to sync audio, I can still delete through explorer- so NEAH!!! I just recieved this phone today and as of today i’m pleased but i’m trying to get my computer to recognize it. (I have windows vista, ya’ll know that Vista is a waste of time) but anyway it ain’t doin’ it. HELP!!! Oh and for you folks trying to download music…pull the media card and download the songs to it and your phone will recognize them…thats how I do it. I returned my storm for the Chocolate 3 and I love it. Yes the Storm had great video but the software is slow making using it clumsy and frustrating. Plus it would have cost over $100 per month with the required Backberry plan. With the Chocolate I can listen to music and podcasts easily with no hassles and a cheaper plan. That’s all I need. Music syncs easily with WMP or just drag and drop to the phone. For the record I like that it’s a flip phone and not a slider. To those who can’t sync music extra: Install a memory card first then connect to your PC and click on My Computer or Computer and you will find it as a removable drive: now just drag your files in the respective folders!! If that doesn’t work, take the card out, put it in a adapter and insert it in the memory card slot. Copy music stc. into Music folder. MAKE SURE -ON THE PHONE settings, change the Memory to Card or else you will not see anything again!